A man holds a sign advocating the recall of state Sen. John Morse in Colorado Springs, Colo., in September. Morse and a second state senator who backed the state's new gun control measures were recalled during a special election that month. Former Colorado Senate President John Morse says losing his seat was a "small price to pay" for his support for passing a package of gun control laws. Joe Neville helped lead the effort to recall state Sens. John Morse and Angela Giron. He says there should be no infringements on Americans' right to own guns. John Morse was president of the Colorado Senate until September, when he became the first elected official recalled in the state's history. Three months later, he's climbing the rotunda steps of the gold-domed Capitol building — his office for seven years. He hasn't been here since October. Gazing up at the dome, he says, "This is one of my favorite things to do. That's my version of smelling the roses." Morse's political career ended over the gun bills he pushed through these chambers eight months ago. But he says he would do it all again. "I have zero regrets," he says. "Keeping people safe is my No. 1 priority, and if that costs me my political career, that's a really small price to pay to keep people from dying at the hands of an M16 in a schoolhouse or in a theater." One year ago, a gunman killed 26 people, most of them children, in Newtown, Conn. The attack came just months after a shooter killed 12 in a movie theater in Aurora, Colo. The attacks prompted a push for state and federal legislation to address gun violence across the country. Colorado moved quickly, passing new limits on ammunition magazines and implementing universal background checks for gun purchases. But there's been a big backlash from some Colorado voters. Morse and state Sen. Angela Giron, a fellow Democrat from a similar conservative-leaning district, were recalled in the months after those bills became law. And another Democratic state senator facing the threat of a recall, Evie Hudak, resigned in November. 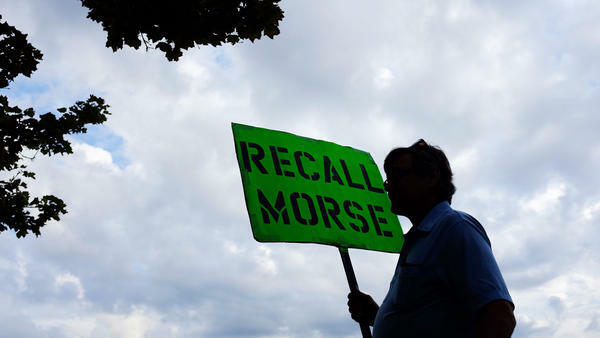 The recall efforts that ousted Morse and Giron garnered a lot of national attention. The National Rifle Association and other gun groups poured in tens of thousands of dollars, as did New York Mayor Michael Bloomberg on the other side. 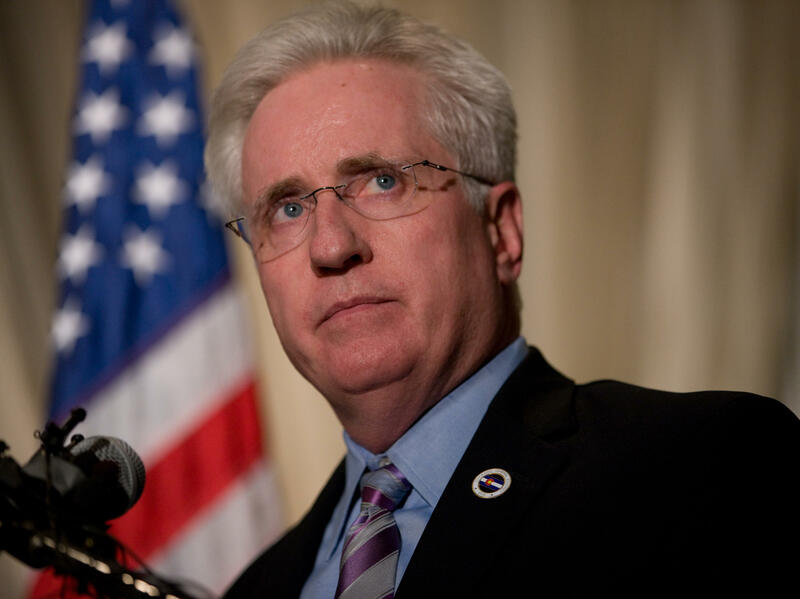 But it wasn't just Newtown or Aurora that drove Morse to push for the gun legislation. He's a former cop and was a paramedic before that. "So I have been to literally hundreds of shootings," he says. "I don't think people understand at all ... the state of gun laws in this country that make it so easy for people to die and/or be seriously injured by a gun." But just as Morse was driven by personal experiences with gun violence, so was another Colorado man on the opposite side of the spectrum. Sixty miles north of the Capitol, in conservative Weld County, is the farming town turned suburb of Windsor. It's where Joe Neville heads up political organizing for the Rocky Mountain Gun Owners, the group that led the Morse recall effort. "I went to Columbine High School," Neville says. "I wasn't there the day of the tragedy, but I had left a few months earlier. I did have a brother in the school that day, a sister-in-law in the school that day." Neville, young and clearly passionate, is sitting on a leather couch at the back of the office. The wood-paneled walls are adorned with Revolutionary War paintings and pictures of Ronald Reagan. Gun-free zones around schools, he says, "are really just target-rich zones for criminals. And that's exactly what happened that day, is that you had a bunch of students there that had no defense around them." Since the Columbine shootings, Neville says he's worked tirelessly for gun rights. He says armed teachers with the right training could have saved lives on that day back in 1999, or last year in Newtown. Asked about the recall campaign that he helped coordinate, Neville's face widens into a proud grin. "Anytime you can get tens of thousands of people across a state, in each district, to come out and fight for freedom, yeah, it makes me happy," Neville says. "It gives me hope that the radical leftists that are controlling Washington, D.C., and all the way down to the state and county levels, they don't control the people. Which is what they want to do, they want to control the people." Listening to these two men — the gun rights activist and the ousted state senator — you get a real sense of the two Colorados: deep red and deep blue. It's not unlike the way people talk about national politics these days. But in Colorado, there is a middle ground. Polls have shown support for some gun control measures, like expanded background checks. Still, three months after the recalls, eight months after the bills passed, a year after Newtown and 17 months after Aurora, Neville and Morse are still as dug in as ever. "Second Amendment is, as written in the Constitution, we don't compromise on our gun rights, at all," Neville says. Morse says that's "ridiculous. I mean, that's just asinine. And yet that's where the Republicans are: 'Nope, we don't need background checks. Everybody that wants a gun gets a gun.' "
Morse, the ousted Senate president, packed up and moved out of his hometown, Colorado Springs, after he was recalled. He's now living in Denver, where he's starting a new group to push for universal background checks across the country. "In Colorado, we fixed the problem," Morse says. "But there are plenty of other states in this country where you can go to a gun show and buy a gun without a background check, much less go to the trunk of someone's car on a street corner and buy a gun. That's just not a good idea." And for Neville, there are no more recall efforts on his agenda right now. He's focused on more Democrats in swing districts whom his group considers vulnerable on guns. "The individuals, the people, the citizens in Colorado specifically, are standing up. We're going to move things back in the right direction," he says. There is one thing these two men agree on: The fight over gun control versus gun rights is going to continue in Colorado. They're both looking to the 2014 elections as the next battleground. This is ALL THING CONSIDERED, from NPR News. I'm Melissa Block. And I'm Audie Cornish. A year ago this week, a gunman opened fire at a elementary school in Newtown, Conn., killing 26 people, most of them children. The horrific attack prompted a nationwide push for legislation to address gun violence and today, we'll hear what became of some of those efforts. Colorado had just experienced its own gun massacre at a movie theater in Aurora. The state moved quickly, passing new limits on ammunition magazines and universal background checks for gun purchases. Then came a backlash from some corners of the state, as NPR's Kirk Siegler reports. KIRK SIEGLER, BYLINE: John Morse hasn't been in this building since October. JOHN MORSE: This is one of my favorite things to do. Oh, yeah. SIEGLER: We're climbing the steps of the rotunda, the gold-domed Colorado Capitol, his office of seven years. Morse was president of the state senate until September, when he became the first elected official recalled in this state's history. Hardly a few minutes passes before he's spotted by some former staffers. UNIDENTIFIED WOMAN: I can't believe that you're in this building, and you didn't tell us. SIEGLER: Morse has frosty white hair and a friendly demeanor. His political career ended over the gun bills he pushed through these chambers. But eight months after their passage and three months after his recall, he would do it all again. MORSE: I have zero regrets. Keeping people safe is my No. 1 priority, and if that costs me my political career, that's a really small price to pay to keep people from dying at the hands of an M-16 in a schoolhouse or in a theater. SIEGLER: The recalls that ousted Morse and a fellow Democrat from a similar, conservative-leaning district got a lot of national attention. The NRA and other gun groups poured in tens of thousands of dollars. So, too, did New York Mayor Michael Bloomberg on the other side. But it wasn't just Newtown or Aurora that drove Morse to do what he did. He's a former cop and before that, he was a paramedic. MORSE: So I have been to, literally, hundreds of shootings. I don't think people understand at all the state of gun laws in this country that make it so easy for people to die and-or be seriously injured by a gun. SIEGLER: But just as John Morse was driven by personal experiences with gun violence, so was another Colorado man on the opposite side of the spectrum. Sixty miles north of the Capitol is the farming town-turned-suburb of Windsor in conservative Weld County. 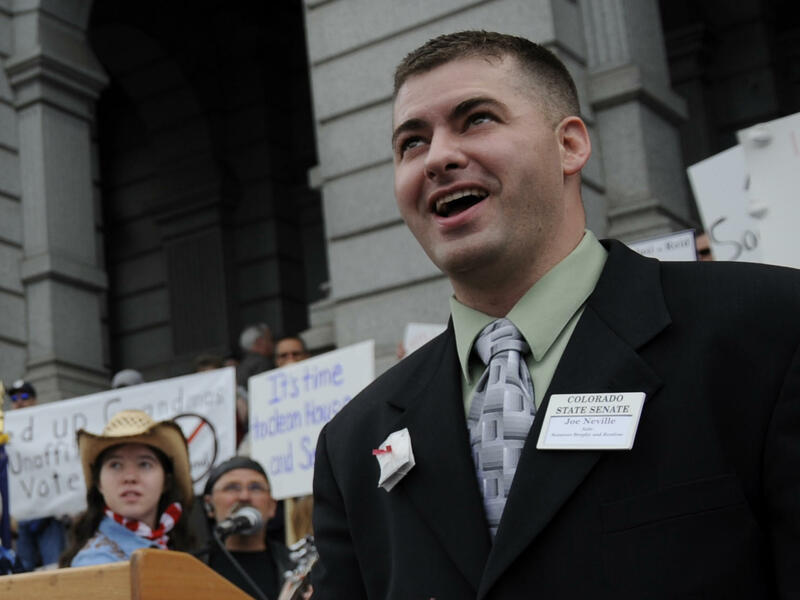 It's where Joe Neville heads up political organizing for the Rocky Mountain Gun Owners Association, the group that led the recall effort for former Senate President John Morse. JOE NEVILLE: I went to Columbine High School. I wasn't there the day of the tragedy, but I had left a few months earlier. I did have a brother in the school that day, a sister-in-law in the school that day. SIEGLER: Neville, young and clearly passionate, is sitting on a leather couch at the back of the office. The wood-paneled walls are adorned with Revolutionary War paintings, and pictures of Ronald Reagan. NEVILLE: I saw what gun-free zones, as they call them, which are really just target-rich zones for criminals. And that's exactly what happened that day, is you had a bunch of students there that had no defense around them. SIEGLER: Neville says armed teachers with the right training that day back in 1999 - or last year, in Newtown - could have saved lives. Asked about the recall campaign that he helped coordinate, Neville's face widens into a proud grin. NEVILLE: Anytime you can get tens of thousands of people across a state, in each district, to come out and fight for freedom, yeah, it makes me happy. It gives me hope that the radical leftists that are controlling Washington, D.C., and all the way down to the state and county levels, they don't control the people. Which is what they want to do - they want to control the people. SIEGLER: And here, listening to these two guys, you get a real sense of the two Colorados. It's not unlike the way people talk about national politics these days. But in Colorado, there is a middle ground. Polls have shown support for some gun-control measures, like expanded background checks. Still, three months after the recalls, eight months after the bills passed, a year after Newtown, a year and a half after Aurora, Joe Neville and John Morse are still as dug in as ever. NEVILLE: Second Amendment is, as written in the Constitution, we don't compromise on our gun rights - at all. MORSE: That's ridiculous. I mean, that's just asinine. And yet that's where the Republicans are - you know, nope, we don't need background checks. Everybody that wants a gun, gets a gun. SIEGLER: As for Morse, the ousted Senate president, he packed up and moved out of his hometown of Colorado Springs after he was recalled. He's now living in Denver, where he's starting a new group to push for universal background checks across the country. MORSE: I mean, in Colorado, we fixed the problem. But there are plenty of other states in this country where you can go to a gun show and buy a gun without a background check, much less go to the trunk of someone's car on a street corner and buy a gun. SIEGLER: And Joe Neville - from the gun rights groups - no more recalls, for now. But his group is continuing to focus on more Democrats in swing districts that they see as vulnerable on guns. NEVILLE: The individuals, the people, the citizens in Colorado, specifically, are standing up. We're going to move things back in the right direction. SIEGLER: There is one thing the two men in this story agree on, it's that the fight over gun control versus gun rights is going to continue in Colorado. They're both looking to the 2014 elections as the next battleground. Kirk Siegler, NPR News. Transcript provided by NPR, Copyright NPR.